Frank Gore ran for a pair of second-half touchdowns and the 49ers rebounded from a 17-0 deficit to beat the Atlanta Falcons 28-24 in the NFC championship game Sunday, sending San Francisco to the Super Bowl for the first time since 1995. The top-seeded Falcons (14-4) tried to pull out another season-saving drive at the end, but Matt Ryan’s fourth-down pass for Roddy White with 1:13 remaining was knocked down by San Francisco linebacker NaVorro Bowman. The 49ers (13-4-1) will meet the winner of the AFC title game between New England and Baltimore. San Francisco will be trying to join Pittsburgh as the only teams with six Super Bowl championships. The victory was sweet redemption for the 49ers, who lost an overtime thriller to the New York Giants a year ago in the NFC title game. Moss Could Come Back For Another Season; Will It Be With The Niners? 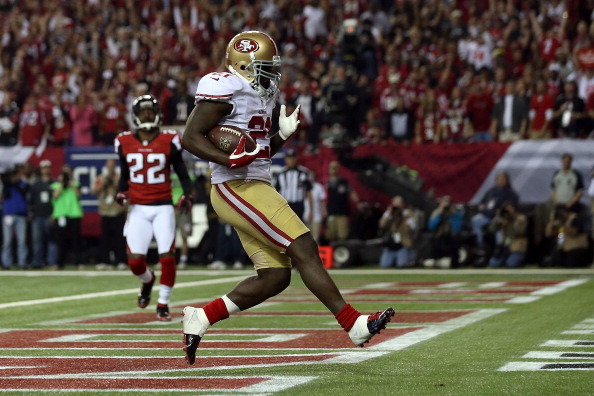 Be the first to comment on "Niners Overcome 17-0 Deficit To Top Falcons 28-24 To Advance To Super Bowl XLVII"